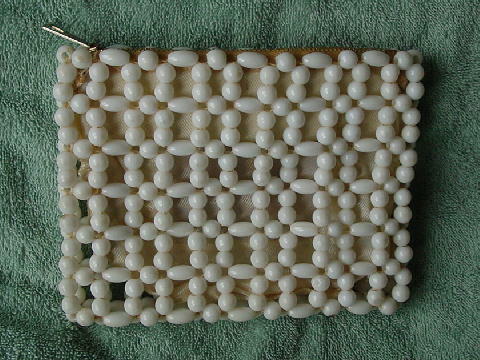 This vintage white plastic beaded clutch purse was handmade in Hong Kong. The fabric lining is in a champagne-antique white. 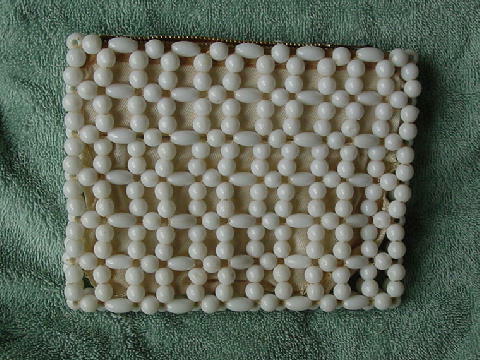 The interior of the lining has large and small age spots on it. There is also an interior open pocket. It has a top side to side pocket. She bought it years ago while on a photo shoot in Hong Kong. The age spots started to appear over a decade ago. She had it cleaned, but it only caused the spots to get larger. Luckily they didn't spread to the exterior. She sold it because she has 4 kids and needs a larger purse to carry all her stuff.